In her iconic large-scale photographs, Candida Höfer presents majestic theaters, libraries, zoos, and museums in lush detail but devoid of the people meant to populate these public institutions. Here, she imbues the more modest Conway Library at The Courtauld Institute in London — known, in part, for its large collection of architecture photographs — with a similar grandeur. Höfer nods to the collection and her place within the history of architecture photography by choosing to capture a large black-and-white photograph of an ornate archway with columns. The dramatic image rests above a humbler scene where two mismatched chairs and a table stacked with open boxes suggests researchers just out of frame. 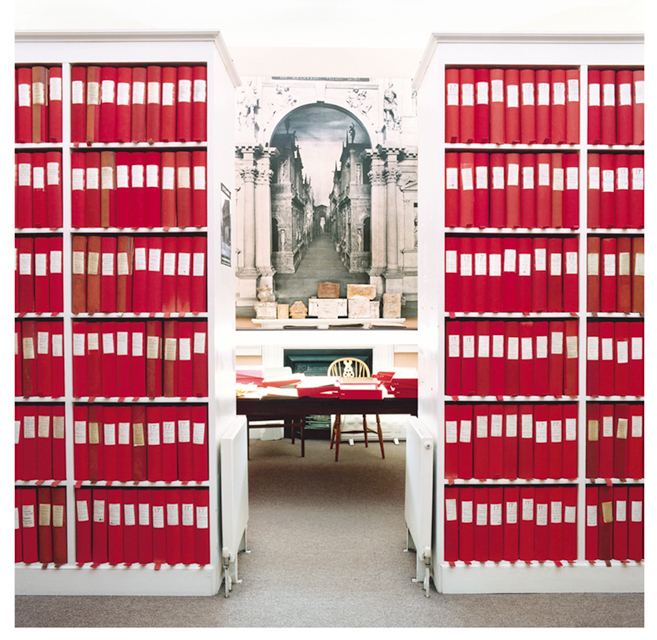 The striking crimson boxes that fill the shelves on either side contain the collection’s photograph archive. The photograph-within-a-photograph echoes some of Höfer’s most iconic images of grandiose spaces, and her penchant for showing buildings in a symmetrical, single-point perspective. Living and working in Cologne, Höfer studied under world-renowned educators and artists Bernd and Hilla Becher at the same time as fellow students Axel Hütte, Thomas Struth, Thomas Ruff, and Andreas Gursky of the Düsseldorf School. Her work is held in countless collections worldwide.